It's a little bit hard to articulate why we love waterfalls so much. Maybe it's the sound of the water as it comes crashing over the rocks below; a hypnotic symphony of tranquility that only Mother Nature can compose. Maybe it's the simple beauty of the waterfall itself, beginning high in the heavens and ending dozens of feet below, lighting up all 5 senses as you stand at its base and let the mist envelop you. 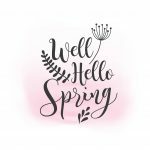 Maybe it's the negative ions that flood your bloodstream as water molecules collide, producing biochemical reactions that have been linked to stress relief and increased energy. Waterfalls represent discovery, a feeling of freedom and constant renewal. 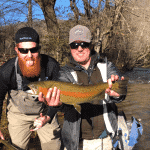 Whatever the reason, waterfalls are awesome, and there's a HUGE selection of them in and around Blue Ridge for you and your whole crew to enjoy; many of which are only a few minutes' drive from your Blue Ridge cabin rental. Question is, which waterfall are you going to check out first? That's up to you and the other guests in your party, but we can certainly help you get started! Here are some of the most popular waterfalls in Georgia near Blue Ridge. Often considered the most popular collection of waterfalls in Fannin County, Long Creek Falls has two distinct drops, totaling about 50 feet. You can access Long Creek Falls from a side trail found where the Appalachian and Benton MacKaye combine with one another. You will reach the falls after a nice 30-minute hike. 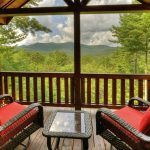 Find your perfect vacation rental home close to Long Creek Falls. Directions: Go 13.5 miles south on Aska Road to its end. Turn right onto Newport Road, go 4.5 miles to end. Turn left onto Doublehead Gap Road, cross a concrete bridge where the road will become dirt/gravel. Continue .3 miles and turn right onto dirt/gravel Forest Service Road 58 (just past the cemetery and church). Ride 5.3 miles on FS 58 to Three Forks area (Hikers Crossing Sign). Noontootla Creek is on the right as you drive. The trail begins on the north side of the road (on the left) and starts as a gradual hike alongside Long Creek. There are three short ascents before reaching the blue-blazed side trail to the falls at 1.1 miles. 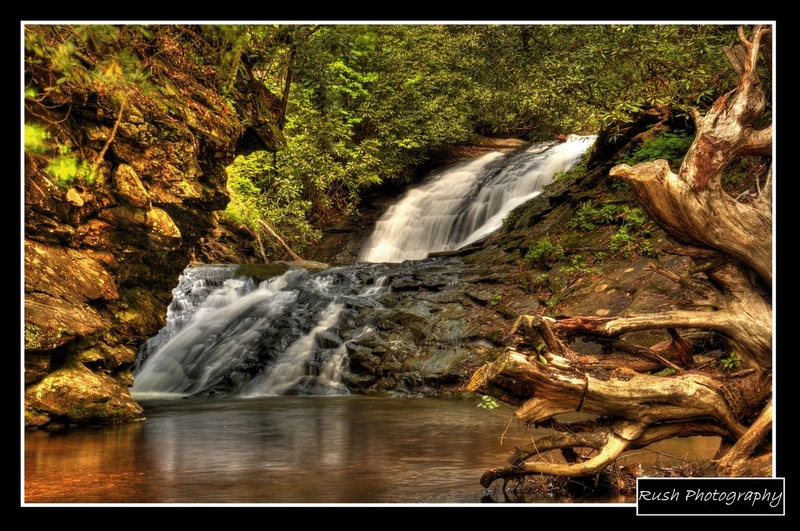 Watch a short video of Long Creek Falls. 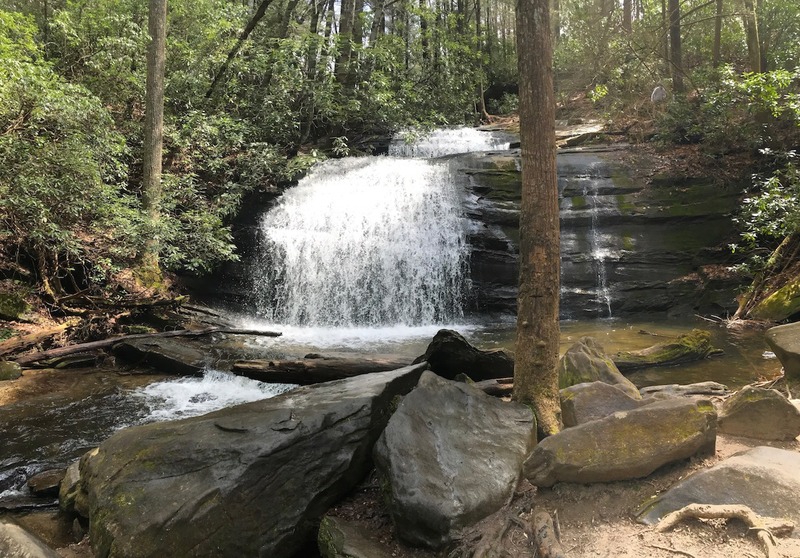 Another one of Fannin County's most popular waterfalls, the upper portion of Fall Branch Falls is located along the Benton MacKaye Trail, west of Aska Road. 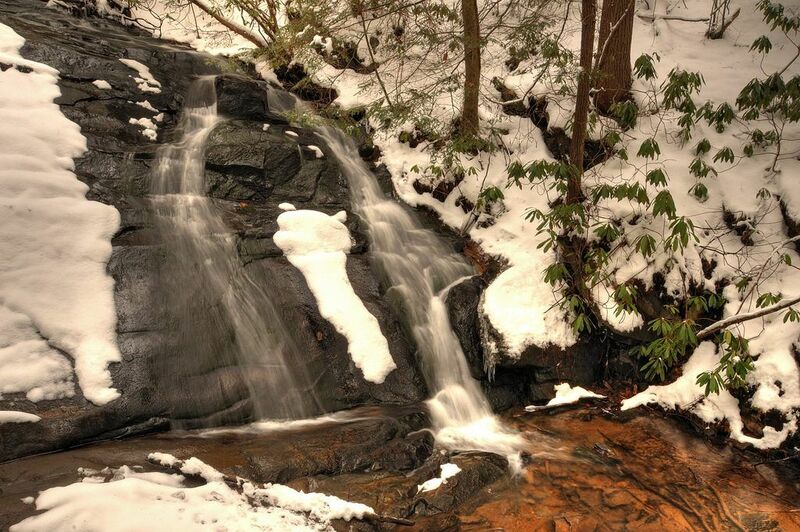 The hike to Fall Branch Falls is shorter than the one leading to Long Creek Falls and features a 30-foot drop into a deep pool at its base. 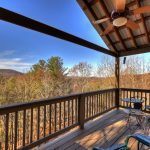 Looking for a vacation rental home near Fall Branch Falls? Click here to explore your options. Sea Creek Falls has one of the easiest hikes of the waterfalls on this list, at less than .1 miles in the Cooper Creek Scenic Area. 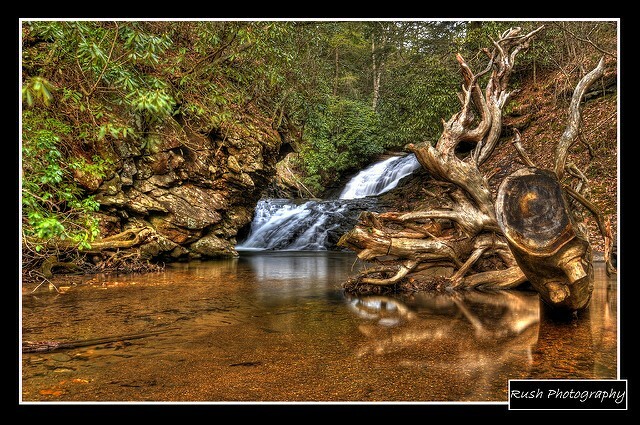 Sea Creek Falls consists of two falls: upper and lower. The upper portion of the falls is made up of a series of steep cascades with a short drop at the bottom. The second set of falls also has steep cascades, and in late Winter and Spring can be a stunning sight if water flows are heavy. Want to stay close by Sea Creek Falls? Discover your perfect vacation rental home. 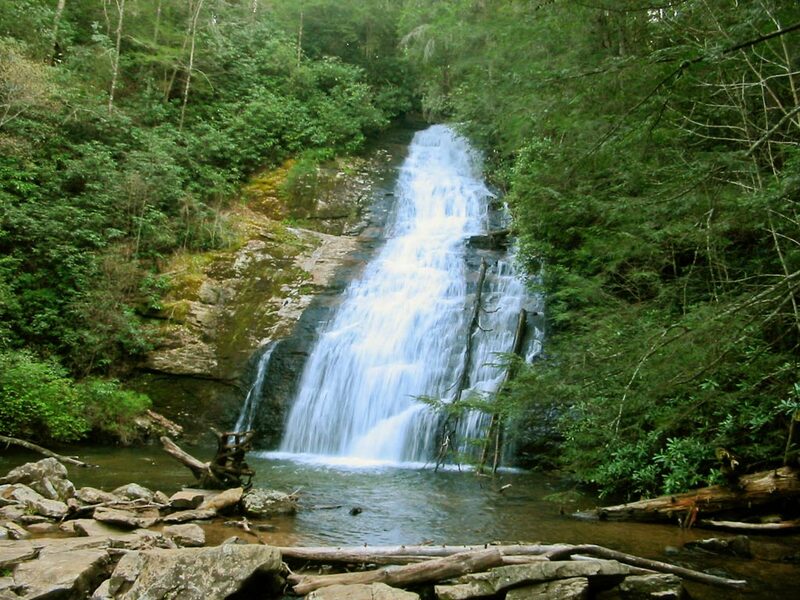 Made up of two falls, Helton Creek Falls are located near Blairsville in the Chattahoochee National Forest. They can be found from a short trail that leads to the first waterfall, which then leads uphill to the second waterfall. Note: the rocks can be slippery, so be careful! 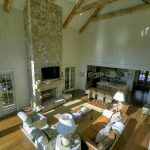 Here are some vacation rental homes that will give you easy access to Helton Creek Falls. Directions: From Blue Ridge, take Hwy 515 north to Blairsville. In Blairsville, take US 19/129 south about 11 miles. Turn left onto Helton Creek Road, the first road past the entrance to Vogel State Park. Go 2.2 miles; the road turns to gravel. There will be a small parking lot on the right in a curve, and the trail is marked. Amicalola Falls is probably the most well-known waterfall on this list, and is the largest cascading waterfall east of the Mississippi River. Located approx. 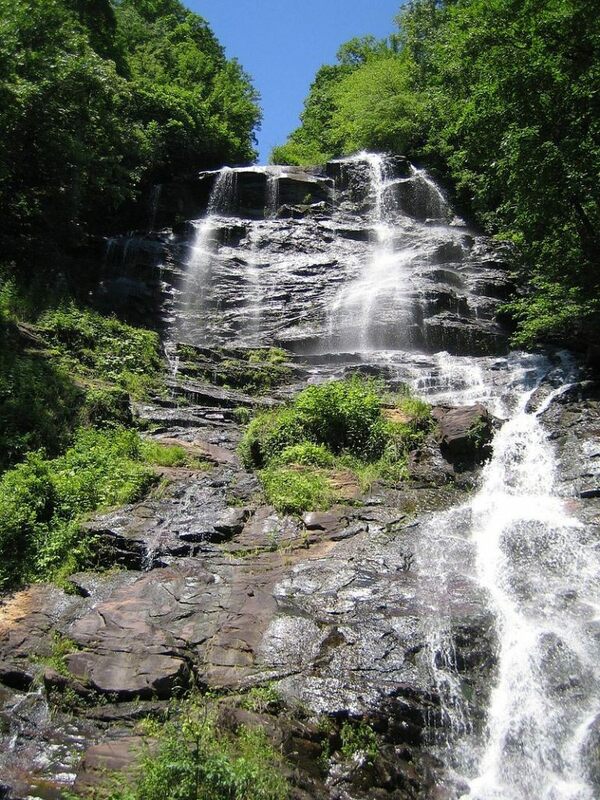 21 miles from Ellijay off of Hwy 52, Amicalola is a must-see attraction if you've never had the chance to experience the drive, hike, and sight of the 729-foot waterfall. 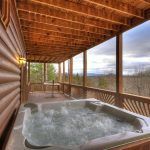 Explore the Cherry Log area for a vacation rental home. Directions: Take US-76 west for 13.6 miles, until you reach GA-52 E. Stay on 52 for 17.7 miles until you reach Amicalola Falls State Park.